The Striped Skunk (Mephitis mephitis) is an omnivorous mammal of the skunk family Mephitidae. Found north of Mexico, it is one of the best-known mammals in Canada and the United States. Striped Skunk skull replica is cast from original specimen. Mephitis mephitis. Mustelidae. Various habitats of S. Canada to upper Mexico. 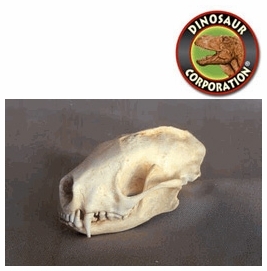 * Striped Skunk skull museum quality replica is cast in durable Polyurethane resins.